Lilac bushes produce masses of white, pink or purple blossoms in the spring. These fragrant shrubs enhance many landscapes when used as hedges, backgrounds and center plantings. However, like many types of shrubs, lilac bushes display invasive tendencies, often outgrowing their intended purpose. Proper removal of lilac bushes includes uprooting the mature species and removing nearby sucker shoots to prevent new shrubs from growing in the same area. Decide what you will do with your removed shrub. Find another area of your landscape to plant it in or ask a neighbor if they would like it. Many gardeners enjoy growing lilacs, so be sure to find a home for yours if you don’t want to transplant it to another area of your property. Have the new hole ready for transplanting before removing your lilac bush. Remove your lilac bush in the fall. Prune away the dead branches and overgrown sections of your lilac bush. Using a garden shovel, dig down deep and wide enough to remove the entire root ball. Avoid cutting through large roots, which causes damage to the shrub. Gently lift the loosened root ball from the surrounding soil. Remove some of the soil from the roots by gently brushing away soil with your hand, lightly shaking the bush and running water over the exposed root ball. Quickly transfer your shrub to its new location for immediate planting. Look for small lilac sprouts near the area of removal. Pull and dig these out to avoid new growth of remaining sucker shoots, which run under the surface of the soil and spread out from the direction of the mother shrub. Loosen the nearby soil with a hoe or garden rake to expose any remaining sections of lilac roots and stems. Remove all traces of lilac vegetation from the area. 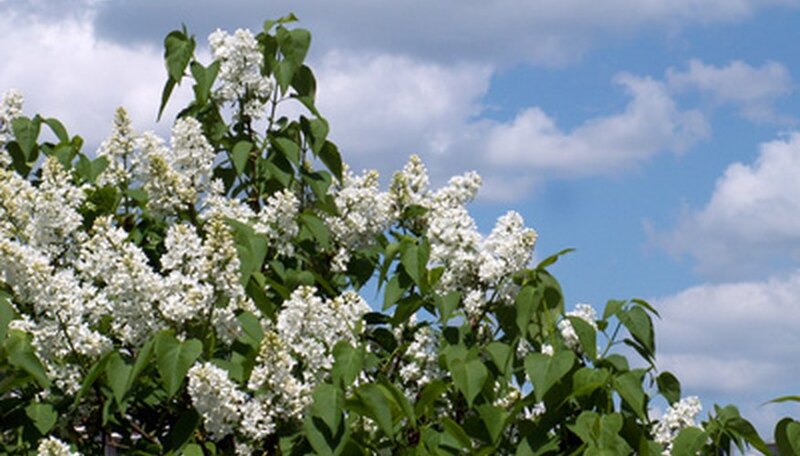 Purchase an herbicide formulated for use in killing lilac shrubs and apply it to the area of previous growth to further eliminate growth of remaining shoots. Follow all instructions on the container, and avoid contact with nearby shrubs, trees and flowers. Plant the area of the removed lilac with groundcover, shrubs or other plants. Keep grassy areas mowed down to avoid the possibility of new lilac growth emerging from stubborn sucker shoots.